In-line product inspection ensures 100% of the products are inspected for conformity, as well as for identifying and removing non-conforming products and impurities. Every step within the process adds value to the final product. With today’s global supply chain, there are an increasing number of locations along the value chain where things can go wrong. Packaging affects how consumers experience product quality, safety, and value. Although identifying and removing non-conforming products at the earliest point has the greatest value, a non-conforming product that reaches the customer might cause the greatest damage to your brand. Such a situation might occur when sliced cheese or meat is packed but small pieces in the seal cause leak where air, fungal spores or even worse, bacteria can contaminate a product. It is at least quite disgusting for the customer when the product is rotten or shows some mould. In the present example, we present a unique possibility for seal inspection after final packaging of food products. Therefore, we prepared the sealed seam of the packaging of sliced cheese and ham with little pieces ham and cheese. If the packaging is printed and not transparent it is impossible to find these defects with conventional vision technology. The Chemical Colour Imaging technology enables a 100% inspection of packaging directly in the process at highest speeds. 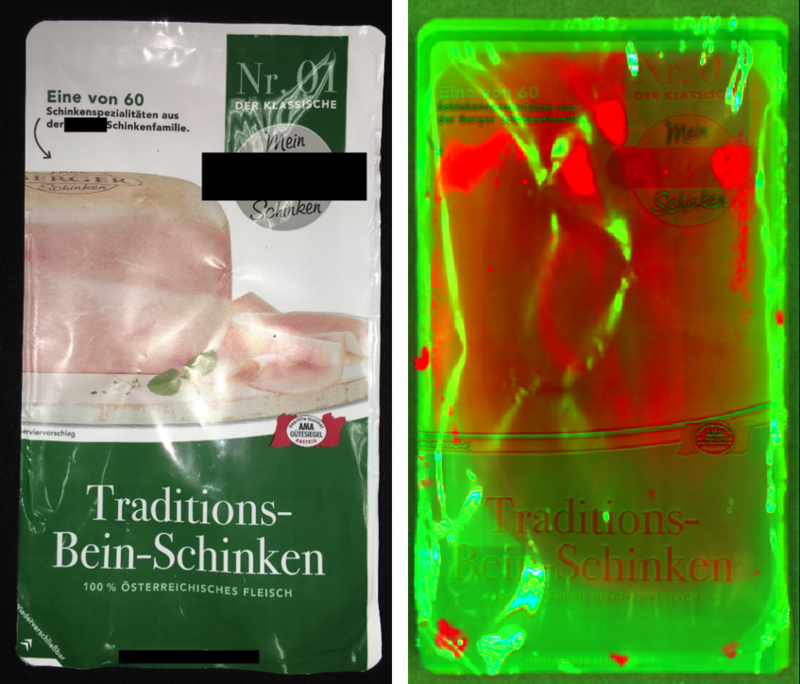 In the images above, the packaging appears in green colour and the cheese in a reddish colour. It can be clearly seen that there are red spots that have destroyed the integrity of the seal. In the present example with ham, also smallest spots of ham can be detected to ensure a perfect product. 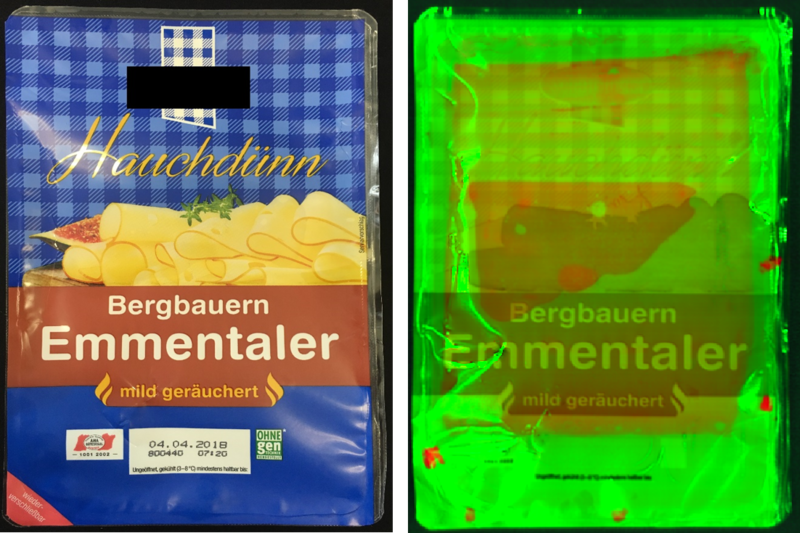 Whatever your product is, if sliced cheese or ham, the Chemical Colour Imaging technology of Perception Park enables you to reject damaged or improper packaging before it is delivered to your customer. This example shows an easy way to develop a plastic sorting application using Perception STUDIO and Chemical Colour Imaging.